At its second annual Xilinx Developer Forum (XDF) in San Jose, Xilinx unveiled strategic moves beyond its mainstay field-programmable gate array (FPGAs) with the introduction of its own accelerator line cards and, more significantly, a new Adaptive Compute Acceleration Platform (ACAP). Xilinx, which got its start in 1984 and now sells a broad range of FPGAs and complex programmable logic devices (CPLDs), is transforming itself into a higher-value platform provider not only for existing workloads but for new domains, especially AI, hyperscale cloud data centers, autonomous vehicles, and 5G infrastructure. In a keynote at the event, Victor Peng Xilinx's new CEO, Victor Peng, who took over the leadership position in January from Moshe Gavriel, said that a transformation is being driven by the rapid rise in overall compute workloads hitting just as Moore's Law is slowing down. Xilinx's chief advantages have been flexibility and performance compared to custom ASICs. As we move into the era of machine learning and artificial intelligence, Xilinx is positioning itself as a better alternative to CPUs (especially Intel), GPUs (especially NVIDIA), and the custom silicon developed by hyperscale cloud giants (especially Google and soon likely others). As part of its updated data center strategy, Xilinx is announcing its own portfolio of accelerator cards for industry-standard servers in cloud and on-premise data centers. The new Alveo PCIe cards are powered by the Xilinx UltraScale+ FPGA, are available now for production orders. Customers can reconfigure the hardware, enabling them to optimize for shifting workloads, new standards, and updated algorithms. Xilinx says performance when used in machine learning frameworks will be great. An Alveo U250 card increases real-time inference throughput by 20X versus high-end CPUs, and more than 4X for sub-two-millisecond low-latency applications versus fixed-function accelerators like high-end GPUs. Alveo is supported by an ecosystem of partners and OEMs including Algo-Logic Systems Inc, Bigstream, BlackLynx Inc., CTAccel, Falcon Computing, Maxeler Technologies, Mipsology, NGCodec, Skreens, SumUp Analytics, Titan IC, Vitesse Data, VYUsync and Xelera Technologies. "The launch of Alveo accelerator cards further advances Xilinx's transformation into a platform company, enabling a growing ecosystem of application partners that can now innovate faster than ever before," said Manish Muthal, vice president, data center, Xilinx. "We are seeing strong customer interest in Alveo accelerators and are delighted to partner with our application ecosystem to deliver production-deployable solutions based on Alveo to our customers." The second big announcement from XDF was the unveiling Versal adaptive compute acceleration platform (ACAP), a fully software-programmable, heterogeneous compute platform that combines Scalar Engines, Adaptable Engines, and Intelligent Engines. Xilinx is claiming dramatic performance improvements of up to 20X over today's FPGAs, and over 100X over today's fastest CPUs. Target applications include Data Center, wired network, 5G wireless, and automobile driver assist applications. Xilinx already has plans for six series of devices in the Versal family. This includes the Versal Prime series, Premium series and HBM series, which are designed to deliver performance, connectivity, bandwidth, and integration for the most demanding applications. It also includes the AI Core series, AI Edge series, and AI RF series, which feature the breakthrough AI Engine. The AI Engine is a new hardware block designed to address the emerging need for low-latency AI inference for a wide variety of applications and also supports advanced DSP implementations for applications like wireless and radar. It is tightly coupled with the Versal Adaptable Hardware Engines to enable whole application acceleration, meaning that both the hardware and software can be tuned to ensure maximum performance and efficiency. "With the explosion of AI and big data and the decline of Moore's Law, the industry has reached a critical inflection point. 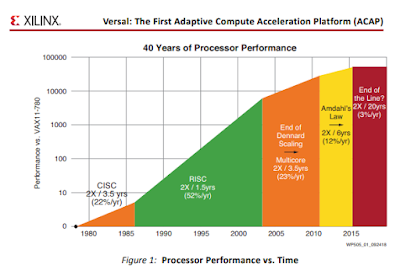 Silicon design cycles can no longer keep up with the pace of innovation," says Peng. "Four years in development, Versal is the industry's first ACAP. We uniquely designed it to enable all types of developers to accelerate their whole application with optimized hardware and software and to instantly adapt both to keep pace with rapidly evolving technology. It is exactly what the industry needs at the exact moment it needs it." The Versal AI Core series, which is optimized for cloud, networking, and autonomous technology, has five devices, offering 128 to 400 AI Engines. The series includes dual-core Arm Cortex-A72 application processors, dual-core Arm Cortex-R5 real-time processors, 256KB of on-chip memory with ECC, more than 1,900 DSP engines optimized for high-precision floating point with low latency. It also incorporates more than 1.9 million system logic cells combined with more than 130Mb of UltraRAM, up to 34Mb of block RAM, and 28Mb of distributed RAM and 32Mb of new Accelerator RAM blocks, which can be directly accessed from any engine and is unique to the Versal AI series' – all to support custom memory hierarchies. The series also includes PCIe Gen4 8-lane and 16-lane, and CCIX host interfaces, power-optimized 32G SerDes, up to 4 integrated DDR4 memory controllers, up to 4 multi-rate Ethernet MACs, 650 high-performance I/Os for MIPI D-PHY, NAND, storage-class memory interfacing and LVDS, plus 78 multiplexed I/Os to connect external components and more than 40 HD I/Os for 3.3V interfacing. All of this is interconnected by a state-of-the-art network-on-chip (NoC) with up to 28 master/slave ports, delivering multi-terabit per-second bandwidth at low latency combined with power efficiency and native software programmability. The full product table is now available. The Versal Prime series is designed for broad applicability across multiple markets and is optimized for connectivity and in-line acceleration of a diverse set of workloads. This mid-range series is made up of nine devices, each including dual-core Arm Cortex-A72 application processors, dual-core Arm Cortex-R5 real-time processors, 256KB of on-chip memory with ECC, more than 4,000 DSP engines optimized for high-precision floating point with low latency. It also incorporates more than 2 million system logic cells combined with more than 200Mb of UltraRAM, greater than 90Mb of block RAM, and 30Mb of distributed RAM to support custom memory hierarchies. The series also includes PCIe® Gen4 8-lane and 16-lane, and CCIX host interfaces, power-optimized 32 gigabits-per-second SerDes and mainstream 58 gigabits-per-second PAM4 SerDes, up to 6 integrated DDR4 memory controllers, up to 4 multi-rate Ethernet MACs, 700 high-performance I/Os for MIPI D-PHY, NAND, and storage-class memory interfaces and LVDS, plus 78 multiplexed I/Os to connect external components, and greater than 40 HD I/O for 3.3V interfacing. All of this is interconnected by a state-of-the-art network-on-chip (NoC) with up to 28 master/slave ports, delivering multi-terabits per-second bandwidth at low latency combined with power efficiency and native software programmability. The full product table is available now. 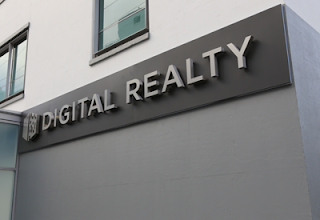 Digital Realty opened a new, state-of-the-art Global Operations Command Center in Clifton, NJ. The new facility continuously monitors and manages the health and performance of Digital Realty's 198 global data centers, providing centralized network and infrastructure monitoring, product support, event management and security. Digital Realty said the new command center also enables advanced communications coordination and standardization for major events and escalated threat conditions for effective regional readiness. Digital Realty staff at all facilities are kept apprised of weather changes and other events through real-time updates and closely monitor developments to fully understand their impact on local environmental and municipal services. "Digital Realty designed the recently expanded Global Operations Command Center to ensure our customers' success and enhance the resiliency of their data center operations," said Erich Sanchack, Digital Realty Executive Vice President, Operations. "The command center enables customers to rapidly adapt to changing technologies and to better utilize the right tools to correlate events, automate certain tasks and provide visibility into network health. Our notifications capabilities, for instance, allow customers to strategically allocate resources for routine and event-driven maintenance across their global footprints. This helps ensure data center availability and safeguards our customers' digital capital to make growing their businesses easier than ever before." 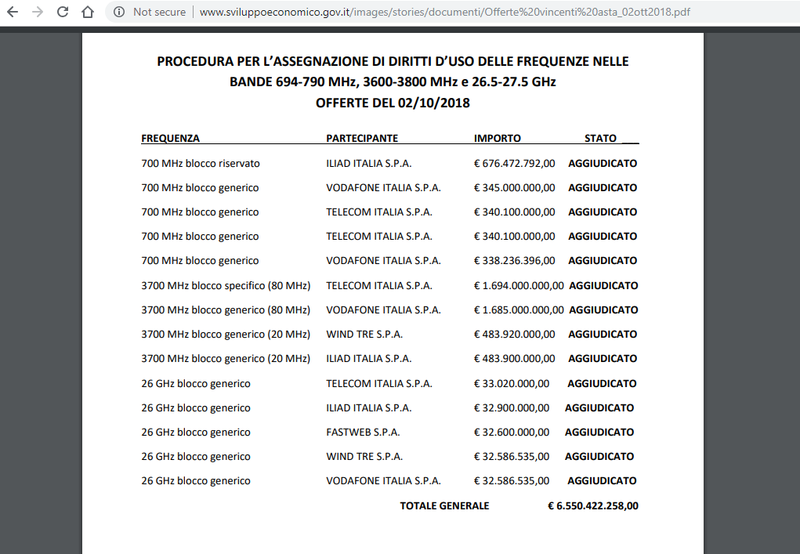 The government of Italy raised EUR 6.50 billion in an auction of 700 MHz, 3700 MHz, and 26 GHz spectrum for 5G usage. The total significantly exceeded the expected EUR 4 billion government forecast. Winning bidders included Iliad Italia, Vodafone Italia, Telecom Italia, Fastweb, and Wind TRE. 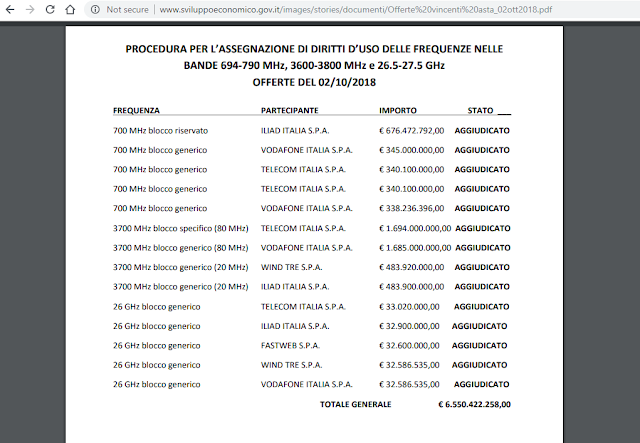 Iliad Italia garnered 10 MHz in the 700 MHz FDD band for EUR 676 million,472,792.00 euros, while Vodafone SpA was awarded 2 generic lots in the 700 MHz FDD band, for a total of 10 MHz at a bid of EUR 683 million, The remaining 2 generic batches in the 700 MHz FDD band, for a total of 10 MHz, were awarded to Telecom Italia for EUR 680 million. Five lots in the 26 GHz band awarded: Telecom Italia won a lot for EUR 33 million; Iliad Italia won a lot for EU 32.9 million; Fastweb SpA won a lot for EUR 32.6 million; Wind 3 won a lot for EUR 32.5 million, and Vodafone Italia won a lot for EUR 32.6 million. Telecom Italia won the specific lot (C1) of 80 MHz for EUR 1.694 billion; Vodafone Italia was awarded a generic lot of 80 MHz for EUR 1.685 billion; Wind 3 was awarded a generic lot of 20 MHz for EUR 484 million; and Iliad Italia won the second generic lot of 20 MHz for EUR 483.9 million. Holston Electric Cooperative (HEC), which serves 25,000 residential and 5,500 commercial and industrial members in the Tennessee Valley, is using ADTRAN’s Total Access 5000 Gigabit services platform with Ethernet Transport Optical Switch (ETOS-10) and GPON. HEC partnered with solution provider FiberRise to build its broadband network. The HolstonConnect network is establishing a long-term, multi-gigabit fiber access solution built on an open, scalable architecture. Holston Electric Cooperative General Manager James Sandlin, P.E., stated "the electric business has become fairly challenging over the past decade. Members are using less electricity each year because the appliances and devices that coop members buy today are more energy-efficient than those they replace. By investing in state-of-the-art broadband infrastructure with ADTRAN access solutions, Holston can diversify our member offerings with triple-play services of voice, video and broadband as well as benefit from newly enabled applications, such as smart grid management of our electrical network and smart home solutions." The Ethernet Alliance hailed the ratification of IEEE 802.3bt, IEEE Standard for Ethernet - Amendment 2: Power over Ethernet (PoE) over 4 Pairs. Among other additions, the newly ratified specification introduces four new classes and increases maximum power levels supplied by a factor of three. IEEE 802.3bt offers a host of new features and capabilities, such as support for highly efficient 4-pair power delivery, and channel definitions for 2.5 Gbps, 5 Gbps, and 10 Gbps PoE operations, among others. Ratified in September 2018, the new specification also boosts the maximum power that power sourcing equipment (PSEs) are capable of by a factor of three, expanding it from 30 to 90 watts, and elevates the power level for powered devices (PDs) to 71.3 watts. Additionally, IEEE 802.3bt doubles the number of supported classes from four to eight, addressing Type 3 and 4 devices for both PSEs and PDs between 4 – 90 watts and 3.84 – 71.3 watts respectively. 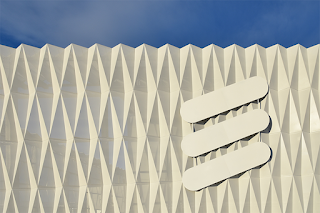 Ericsson will conduct a joint 4G LTE trial using 600 MHz spectrum with Agri-Valley Services and NewCore Wireless in Caro, Michigan. This will be the first 600 MHz trial with a regional carrier in the United States. Agri-Valley Services is testing the performance of 600 MHz band for fixed wireless access for its subscribers. NewCore Wireless, a leader in providing hosted solutions for regional carriers, will offer hosted core services for Agri Valley Services. 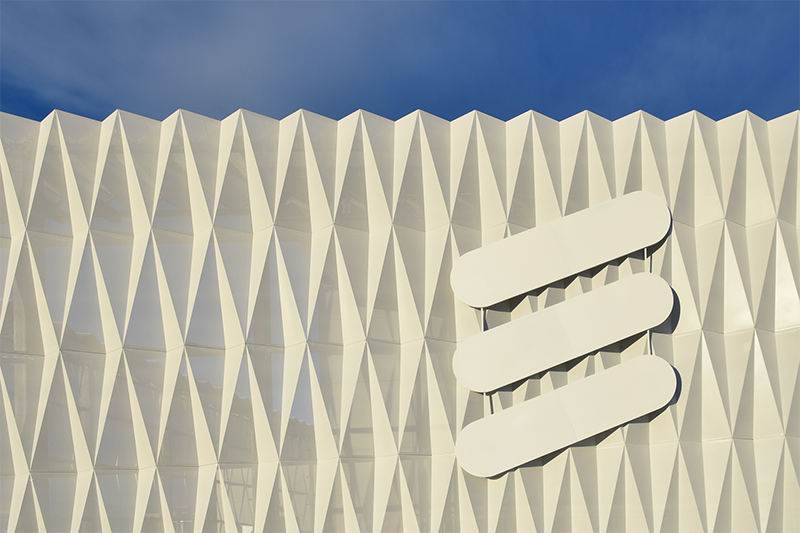 Kevin Zvokel, Head of Networks, Ericsson North America, says: "The success of this trial will be a gateway to enabling 600 MHz 4G LTE coverage to our rural customers on their existing network infrastructure. It will enable more options for customers who want to choose fixed wireless access solutions." Nokia has selected Keysight Technologies’ Nemo Outdoor field test solution, FieldFox spectrum analyzer and Nemo Analyze as several of their preferred toolsets for the measurement of 5G new radio (NR) radio-wave propagation in the field. Nokia will also use Keysight solution fo verification of outdoor and indoor coverage across both sub-6GHz and mmWave frequency ranges. Keysight’s solutions also help enable Nokia to benchmark new software releases and features in the network and validate the quality of the company’s 5G network solutions.